Thank you all for all the "feel better" wishes. I am starting to feel vaguely human again. I give a large part of the credit to Autum. Please pardon the crassness of what I am about to say, but it appears to be the truth: I think she literally scared the snot out of me. Panda Update - well, I've not had any more luck with a sweater for her. 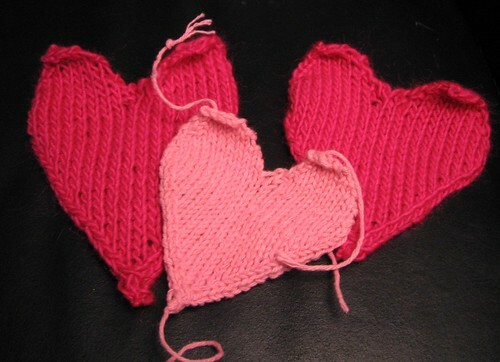 And I suspect that my new found interest in hearts is a nice procrastination technique so I can delay tiny-sweater-making even further. Laundry Update: I finally got around to trying the vinegar instead of fabric softener trick... I think that I am a fan. The novelty of fabric softener has not yet worn off - I do love the way that it makes everything smell. But, I've not wanted to use it on the towels, since I've heard that it messes up the absorbency. So, I've been using a quarter cup of white vinegar in the fabric softener dispenser when I wash towels. I've heard that it's good to put vinegar into the dispenser periodically, so as to clean out any fabric softener buildup. I'll definitely continue to use vinegar with the towels - and as my love affair with fabric softener exits the honeymoon stage, I could see me doing this for all the laundry. ark. human? oh, feel better soon. please! your hearts are sweet. maybe, and this is just a thought, you can stiffen them with starch and sell them to the strippers as pasties? maybe add tassels to them. serendipitous that vinegar came up in conversation at my house yesterday, too. ian carried chili in his soup thermos. then he washed it, but he said it still smells like chili. somewhere? he found info about swizzling vinegar in there to take away the odor. oh, i know, something in the paper, about natural cleaning methods. of course, lil' know it all me said "yep, vinegar and baking soda are two of the best things for natural cleaning." you see, i have the knowledge, but i don't apply the knowledge. i'm keeping my fingers crossed that the cleaning fairy will pop in one day and help me out. I like Bekka's idea for the hearts. Strippers need to stay warm too. hmmm... i wonder if apple cider vinegar would work. or rice vinegar. damn white vinegar, being made of wheat and all. Oohh... maybe we could use those hearts to cover a belly dance bra. Just a thought. I vote for the stripper pasties! Glad you're feeling better and are on the road to recovery. I like the hearts, very cute! yay! So glad your week is turning around. Those hearts are cute. If you knit them in cotton, they'd make great wash cloths. As always, you are a total hoot. And, Bekka's comment on the hearts???!!!!!HAAAAA! I'm sitting here at my desk dying with laughter. I do like the hearts, though (as a Valentine's decoration, not as dance apparel). Maybe I can convince my sis to knit some for me.